Nokia shunned Android for Windows Phone 7 and to many that was a big disappointment. Nokia make great hardware there’s no doubt, couple that with Android and we can only imagine how great it would of been. 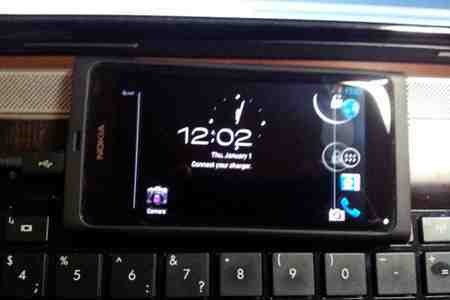 Well, the Nokia N9 was a much loved device that run there own MeeGo Harmatten OS. Sadly it didn’t make the cut with WP7 taking over as Nokia’s main Smartphone OS. Thanks to the Android Community and its love of bringing new life to otherwise left for the scrapheap devices we have a saviour. Alexey Roslyakov, who is apart of the NITDroid team that has in the past been porting Android to the N900, and now also the much coveted Nokia N9. He has tweeted the image at the top of this post with the message bearing simply “Progress”. It’s looking like early days, with a lot of work to be done and whether it can be accomplished remains to be seen. With the prospect of the Nokia N9 and its sublime 3.9″ designed smartphone running ICS, well its mouth watering, I would buy one in an instant.